Pros: This camera is great once you get the hang of using it you can take some great pictures. I have even been able to take some good pictures of the moon with the stock lens had to crop heavily but they look good. The 50D is a nice upgrade camera; I have owned several of the "crop" cameras including the XT, XSi, 40D, etc. The new 50D is definitely worth moving up. The LCD is a huge improvement; the extra MPs give you a lot of cropping room. The camera focuses quickly, and is quite accurate. DSLR photography is SOOO much better than point and shoot! After taking a series of shots of my five year old daughter at her t-ball game with my new Canon EOS 50D, I told my wife that the camera just paid for itself. The captured image is very impressive. We're creating memories here. Worth every penny. Oh, and the interface is super simple. I was tempted to return it and get the Panasonic Lumix that comes out next month (June 2009) but once I got my hands on this baby, I couldn't bear to part with it. Canon 50d - the best ! Amazon - the best ! Pricing in amazon is very good taking into account it is one of the most, if not the most reliable on-line merchant. 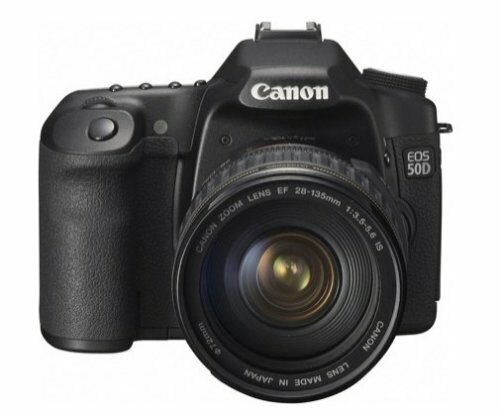 Thank you Jodi-Ann Richards, for such a detailed review on the Canon DSLR 50D. I am looking at buying a DSLR, and have my 'eye' on all the newest models. I have a Canon Film SLR Rebel Ti, and have read reviews for the Xsi and the new Rebel Ti1 and other DSLRs with Nikon and Canon. I have been very happy with Canons, and the 50D sounds treamedous and very clear image quality at 15.1 megapixels. I have a photography blog online, and have had photos published in magazines and calendars. I mostly take photos of landscapes, nature, travel, scenery, portrait, pets, etc. I have read many positive and a few negative reviews about the 50D, and it sounds tremendous. I have also researched the Canon 5D Mark II, but the price bracket seems very expensive. I have 2 Canon EF lens, a 90mm and a telephoto 300mm, and consider myself as a semi-professional photographer; by no means a beginner. Would the 50D be the 'best' choice? I bought the 50D some four months ago and took it to a couple of trips, family events and photo sessions. I am very happy with it. The picture quality is outstanding, especially portraits and low-light pictures. The features are extensive and pretty handy. I would classify myself as experienced beginner with some ambitions but only little time. Nevertheless I managed to shoot a couple of impressive photos at sports events, parties and landscapes. The camera is very robust. The material and the built is of high quality. Its fun to take it outdoors and play around with it. I would definitely recommend this perfect piece of japanese engineering. Two remarks on negative aspects that were made. I am an amateur photographer and have used the camera now for a few months and am enjoying getting good results. However, I would like to comment that the overall "Exposure Control" modes which are designed for a newbie like myself (e.g. Portrait, Sports, Close Up, etc.) do not allow many of the parameters of the camera to be adjusted. One example is that while in some of these modes you cannot disable the flash. Another is that the color temperature cannot be adjusted in certain modes. My opinion is that it would be beneficial if these modes were expanded such that more of the camera's available features could be adjusted while in the the Exposure Control modes designed for new users. Additionally it would be nice if each one of these modes were allowed to be adjusted and saved independently. Perhaps a "Factory Default" - "Sports" mode (A) which cannot be edited and then additional customizable "Sports" modes versions (B,C,D,E,F) each of which is essentially the factory default mode but with user overrides. The customizations retain settings during battery changes. Hopefully once I learn to use the Manual Mode more intelligently this will probably no longer be an issue. I will probably keep this camera for long time. Get a Canon 40D instead. Let me start by saying that I started as a Canon owner in DSLR world (Canon Rebel XSi 450d). That was my first camera, and I loved it. I intermediately tried a Nikon D90, owing to its apparently great noise performance and the punchy color rendition... only to realise Nikon lags a bit in LiveView implementation which was better even in an XSi. So I ordered a Canon 50d, hoping to get the liveview I wanted, PLUS a noise performance better that even the Nikon D90 (rival?). - Nikon D90 allowed me to capture sharp indoor pictures in room lighting with minimal noise as compared to the Canon 50d. And I have images to compare.. not 1 or 2.. but hundreds. In the end, I realised that a better Canon 50d liveview may perhaps help me in technically getting good pictures... but a Nikon D90 gives me the end results that I love.. and love going back to look at. The difference is very subjective.. and has more to do with aesthetics than the technicalities. You have to go through both the cameras to understand that. - The lens-specific auto-focus micro-adjustment feature is cool. I actually needed to use it with the first lens I purchased: A Tamron 17-50mm f/2.8 which was terribly off-shooting.. by about 17 units (as seen on the calibration screen). However, I wasn't too sure I needed that feature.. since I am not a professional. - Noise performance isn't comparable to even cheaper models like Nikon D90. And no matter what you say about in lab tests and technical data, its the end result that matters. And I couldn't get the same results from a 50d that I could from a D90. Read more about independent noise tests on imaging-resource here: http://www.imaging-resource.com/PRODS/E50D/E50DHI_ISO_NR.HTM. Search for "50D vs D90 Comparison". - Very hard to get the punch out of the colors using just the picture style editor. The color transformations are unitary...you cannot rotate the whole color wheel or work on big sections of the color spectrum all at once. - Heavy. And I mean HEAVY with a good size lens. - A tad big for me. then Canon 50d is for you. If, however, you already own a Canon 40d, I dont think just extra MP and a brigher LCD will do you any good from a 50d. Plus a 40d may serve you equally or even better in terms of performance. Remember, there are always alternatives like the Nikon D90. And for $1500 (as of Jan 27, 2009), you can even get a 70-300mm VR lens with a basic 18-105 kit lens. It is a wonderful kit for an intermediate dSLR enthusiast. Whichever way you decide, I wish you luck in that you enjoy your purchase! Edited 03/24/2009: I have since tried a Canon 40D along with a Nikon D90. And comparing just the RAW images, my impression is that Canon 40D gives sharper and more detailed results compared to the Nikon D90.. given similar lenses and lighting conditions. The D90, however, has at least 1 stop advantage in usable ISO range, and has the vivid blues/greens in off the camera images that some people like. I can thus comfortably recommend a Canon 40D over the 50D, and along a Nikon D90. Reasons? Cheaper than a 50D, same price as a D90 (as of 3/24/09). Also, pro level Nikon glass is much more expensive than the Canons. Compare a 24-70 f2.8 or a 70-200 f2.8 between the two brands. In case you do decide to get a Canon 40D, you may want to check out my post on how to get Nikon like colors off a Canon40D here: prashchopra.blogspot.com/2009/03/getting-nikon-vivid-colors-from-canon.html . This camera is breathtakingly outstanding! If you're seriously considering doing some professional photography but you're a little irked by the price tag of DSLR offerings ($2,000 for the body and above), then stop here. You will not be disappointed. For those reviews stating that images are "too soft", etc., please check Jodi-Ann Richards' review that nearly has 600 helpful votes (as of 1/29/09). She covers the camera in exhaustive detail. If you don't have time to review her pages-long review, however, here's a quick summary of her bottom line: this camera's megapixel count of 15.1 REQUIRES GOOD OPTICS. It follows the old saying of "garbage in garbage out". If you buy cheap optics, then you'll be horrifically disappointed. You need the good optics to exploit the most of its 15.1 megapixel capabilities. That said, some reviews (notably dpreview.com) have stated that the increase of 5 megapixels from the 40D and the 50D are hardly noticeable, but keep in mind that they are testing the camera using one of the cheaper lens options. They do go on to say, however, that the megapixel count does demand good optics. I dare say that they would have been more pleased with the image quality if they had purchased one of Canon's "L" lenses. I personally bought a Canon EF 24-105mm f/4 L IS USM lens ("L" is Canon's "flagship" line). The lens itself costs almost the same as the body itself, but is well worth it. The optics on this lens and the autofocus speed (lightning quick for a walkabout telephoto) is superb and the image results do not disappoint. Also, being able to maintain a f/4 aperture throughout the full length of the zoom is nice. If you're looking into professional work, feel that the Canon Rebel doesn't give you the control that you'd like, and feel that spending more than $2,000 for a camera body is too much, then this is your camera. It maintains the balance of being able to be fully automatic to allowing you to manually adjust aperture, ISO speed, shutter speed, etc. by yourself. OMG! My Son is finally in LOVE!